German physician; born at Heidelberg Feb. 7, 1848. Educated at the universities of Heidelberg, Berlin, and Vienna (M.D. 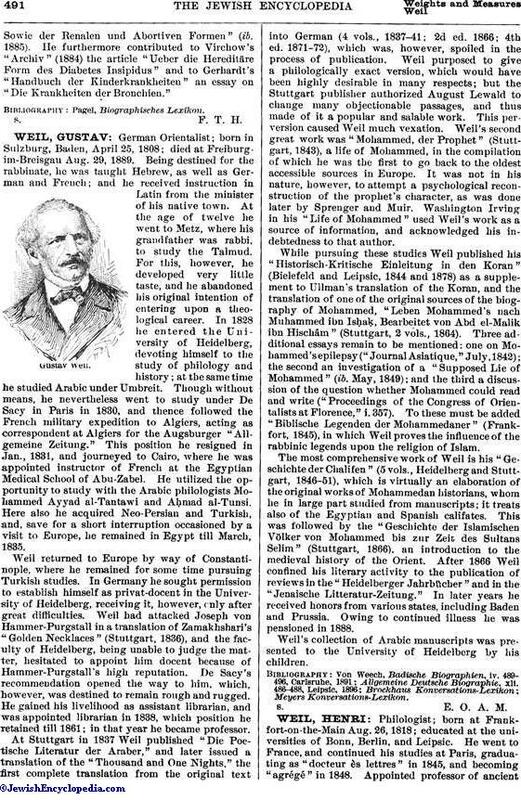 1871), he settled in Heidelberg, where, in 1872, he became privat-docent in special pathology and therapy and in 1876 assistant professor of syphilology. In 1886 he was called to Dorpat as professor of special pathology and therapy, from which position he resigned the following year on account of sickness. Since 1893 he has practised in Wiesbaden. In 1886 he published in "Dorpater Archiv für Klinische Medizin," vol. xxxix., the essay "Ueber eine Eigenthümliche mit Milztumor, Icterus und Nephritis Einhergehende Acute Infectionskrankheit," treating of a disease which has since become known as Weil's disease. Among his works the following may be mentioned: "Die Auscultation der Arterien und Venen" (Leipsic, 1875); "Handbuch und Atlas der Topographischen Percussion" (ib. 1877, 2d ed. 1880); "Zur Lehre vom Pneumothorax" (ib. 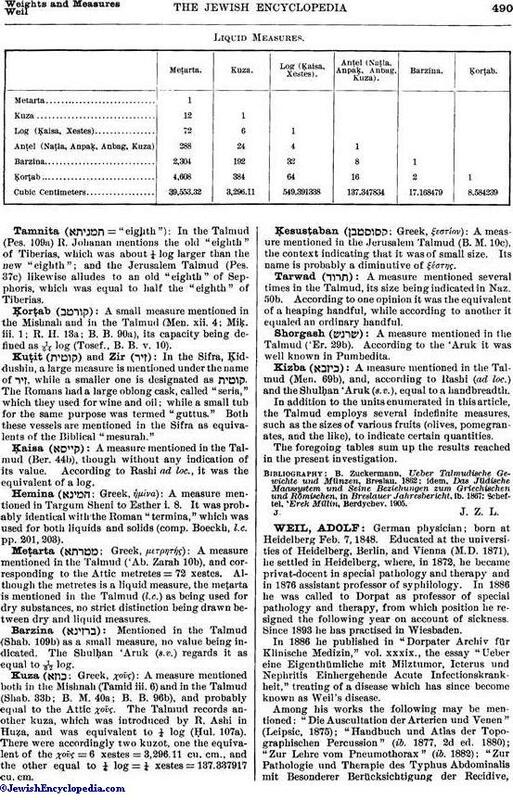 1882); "Zur Pathologie und Therapie des Typhus Abdominalis mit Besonderer Berücksichtigung der Recidive,Sowie der Renalen und Abortiven Formen" (ib. 1885). He furthermore contributed to Virchow's "Archiv" (1884) the article "Ueber die Hereditäre Form des Diabetes Insipidus" and to Gerhardt's "Handbuch der Kinderkrankheiten" an essay on "Die Krankheiten der Bronchien."